Elon Musk is adept at making headlines, and today he managed to nab a bit of the spotlight with comments that Tesla has talked with Google about developing self-driving car technology. He said he prefers "autopilot" to "self-driving," as the latter implies a vehicle is going to do something the driver doesn't want it to, but said his car company is interested in plugging in driverless tech. "Autopilot is a good thing to have in planes, and we should have it in cars," Musk told Bloomberg. Allowing tech to take over is a logical progression in vehicular evolution he noted, though perhaps Google isn't the ideal partner for the electric motor company. "The problem with Google's current approach is that the sensor system is too expensive," Musk said. "It's better to have an optical system, basically cameras with software that is able to figure out what's going on just by looking at things." Google and Tesla have had "technical discussions" about the Lidar laser tracking system Google implements in its self-driving cars, but the likely approach for the carmaker is to develop its own unique technology. "I think Tesla will most likely develop its own autopilot system for the car, as I think it should be camera-based, not Lidar-based," Musk wrote in an email to Bloomberg. "However, it is also possible that we do something jointly with Google." The buzzy billionaire's comments stirred up some "it's coming!" excitement, but Musk took to Twitter to temper Bloomberg's report. 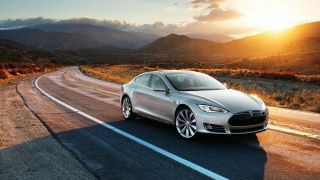 "Creating an autopilot for cars at Tesla is an important, but not yet top priority," he tweeted. "Still a few years from production." "Am a fan of Larry, Sergey & Google in general, but self-driving cars comments to Bloomberg were just off-the-cuff," he wrote 10 minutes later.